Set up in the second episode of the season, Chuck Vs The Suitcase, the show finally caught up to the audience and gave them the Chuck and Sarah engagement. Waiting for eleven episodes was a test in patience, and story pacing, especially after the multiple aborted attempts in Chuck Vs The Balcony. Fortunately when the proposal came it was shot from a distance. No further words were needed because they had all been said before. Much like the pull away shot on the Mexican Beach at the end of The Shawshank Redemption, when Red finally tracks down Andy Dufresne, some things can be conveyed as eloquently by visuals alone. Sarah’s embrace made it quite clear what her answer was. Viewed as a stand alone episode, Chuck Vs The Push Mix was lot of fun. Chuck finally was released from his season long shackles and made a stand. Using his long dormant wits Chuck manuevered Volkoff to the Orion cabin. Here Chuck fittingly used his father’s, aka Orion, tech in conjunction with his brains to bring Volkoff down. No Intersect needed, thank you very much. Showrunner Josh Schwartz trumpeted that the last ten minutes of this episode were the best ten minutes ever done in the series. For my money I will take the showdown sequence in the Orion cabin between Chuck and Volkoff as being more entertaining. But even that sequence would not constitute the best ten minutes of Chuck ever. Chuck and Morgan had a lot of great scenes from the arming themselves at the Castle with office supplies so they could map out their strategy, to the torture bathroom from hell scenes where the first go around they grabbed the wrong guy, to the scuba suit scenes where Morgan flopped around in his flippers and learned to his chagrin that he should have worn clothes underneath, and to the Morgan laser room scene – even if it was recycled from before and went on a bit too long. Timothy Dalton as Volkoff continued to delight. His need to talk to MamaB after feeling down about fatally dealing with an unsatisfactory employee and his having an ice cream cone aboard the Contessa was great stuff. Volkoff’s mania and scenery chewing, threat menacing ability shone brightly in the Orion cabin. His ego swagger was great to see quashed when it dawned on him that Chuck had outsmarted him. Chuck duping Volkoff into giving up the password to his Hydra data base was a sweet moment indeed. MamaB and Sarah had their moments but this was really Chuck’s episode. It was great to see Alex again even though she did not have much to do. Casey gave Awesome some sage words on advice on about being there for Ellie as Clara’s birth became imminent. It was a hoot to see Awesome fall apart when his meticulously planned going into baby hospital run failed out of the gate because the Push Mix CD was missing. CGI Robot Spy. I’m having a Johnny Quest flashback! Chuck makes a stand. Finally! Office supplies = Chuck plan time. Ellie’s placenta made into vitamin pills? Eww! How are we going to unhear that? Morgan with flippers = Yoga Seal – new branch of the Marines perhaps? Devon’s Awesome Baby Run Plan falls about without Push Mix. Plan B = CIA Hotline! ‘Death is a solution to all problems.’ Volkoff quotes his favorite poet and humanitarian. Power Sweeper brushes away all the season arc dangling and unresolved story lines. Turning to the seasonal arc, Chuck Vs the Push Mix, addressed none of the carry forward items. This blunts the payoffs of the season arc. MamaB and Volkoff’s motivations are never clear so there was never any sense of real danger during this arc. Part of the problem also there is no clear story device of tension pushing the main characters. In the first two seasons there was always the threat of Chuck being bunkered. 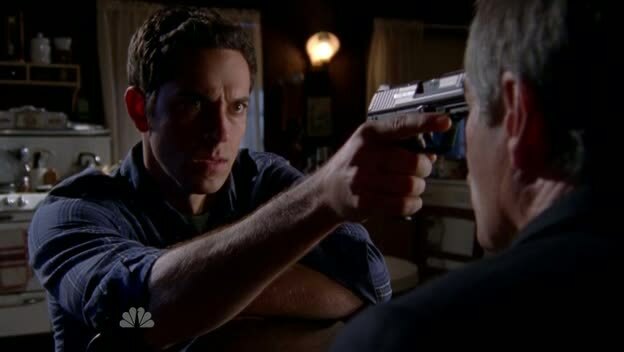 The third season had the tension of Chuck literally losing himself to become a spy. This season the main driving force is Chuck finding a moment to propose to Sarah. Enjoyable for the characters but hardly the story line to place all the marbles on for driving tension. Given the track record of the past three seasons, and as painful as it is for a big fan of serialized storytelling as myself to suggest, the show would do better to switch its focus to stand alone episodes. Or very short story arcs of two to three episodes. The power sweeper in the last shot gave me an unexpected chuckle. Look! There goes all the unresolved season story threads! The inability to hold and satisfactorily answer story threads of longer arcs this season, and previous ones, offer ample evidence that a switch in story telling gears should be tried. Chuck Vs the Push Mix offers a lot of entertainment as a stand alone episode. Many great moments as we have come to expect from this fantastic cast spiced up by the superlative work of Timothy Dalton and Linda Hamilton. It bears repeating. The episode ended with the perfect proposal scene.